Product prices and availability are accurate as of 2019-04-25 11:42:06 UTC and are subject to change. Any price and availability information displayed on http://www.amazon.com/ at the time of purchase will apply to the purchase of this product. Star Wars: The Complete Blu-ray Saga will feature all six live-action Star Wars feature films utilizing the highest possible picture and audio presentation. (32 Years Before Episode IV) Stranded on the desert planet Tatooine after rescuing young Queen Amidala from the impending invasion of Naboo, Jedi apprentice Obi-Wan Kenobi and his Jedi Master discover nine-year-old Anakin Skywalker, a young slave unusually strong in the Force. Anakin wins a thrilling Podrace and with it his freedom as he leaves his home to be trained as a Jedi. The heroes return to Naboo where Anakin and the Queen face massive invasion forces while the two Jedi contend with a deadly foe named Darth Maul. Only then do they realize the invasion is merely the first step in a sinister scheme by the re-emergent forces of darkness known as the Sith. (22 Years Before Episode IV) Ten years after the events of the Battle of Naboo, not only has the galaxy undergone significant change, but so have Obi-Wan Kenobi, Padmé Amidala, and Anakin Skywalker as they are thrown together again for the first time since the Trade Federation invasion of Naboo. Anakin has grown into the accomplished Jedi apprentice of Obi-Wan, who himself has transitioned from student to teacher. The two Jedi are assigned to protect Padmé whose life is threatened by a faction of political separatists. As relationships form and powerful forces collide, these heroes face choices that will impact not only their own fates, but the destiny of the Republic. (19 Years before Episode IV) Three years after the onset of the Clone Wars, the noble Jedi Knights have been leading a massive clone army into a galaxy-wide battle against the Separatists. When the sinister Sith unveil a thousand-year-old plot to rule the galaxy, the Republic crumbles and from its ashes rises the evil Galactic Empire. 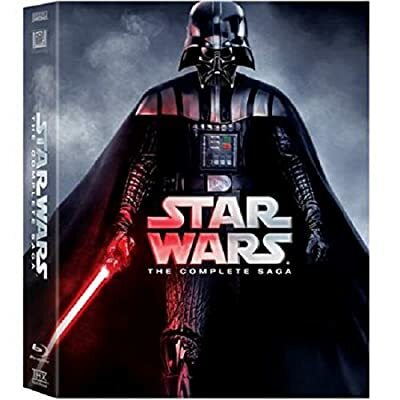 Jedi hero Anakin Skywalker is seduced by the dark side of the Force to become the Emperor's new apprentice--Darth Vader. The Jedi are decimated, as Obi-Wan Kenobi and Jedi Master Yoda are forced into hiding. The only hope for the galaxy are Anakin's own offspring. Nineteen years after the formation of the Empire, Luke Skywalker is thrust into the struggle of the Rebel Alliance when he meets Obi-Wan Kenobi, who has lived for years in seclusion on the desert planet of Tatooine. Obi-Wan begins Luke's Jedi training as Luke joins him on a daring mission to rescue the beautiful Rebel leader Princess Leia from the clutches of the evil Empire. Luke Skywalker and his friends have set up a new base on the ice planet of Hoth, but it is not long before their secret location is discovered by the evil Empire. After narrowly escaping, Luke splits off from his friends to seek out a Jedi Master called Yoda. Meanwhile, Han Solo, Chewbacca, Princess Leia, and C-3PO seek sanctuary at a city in the Clouds run by Lando Calrissian, an old friend of Han’s. But little do they realize that Darth Vader already awaits them. (4 years after Episode IV) In the epic conclusion of the saga, the Empire prepares to crush the Rebellion with a more powerful Death Star while the Rebel fleet mounts a massive attack on the space station. Luke Skywalker confronts Darth Vader in a final climactic duel before the evil Emperor. Episode I, The Phantom Menace "I have a bad feeling about this," says the young Obi-Wan Kenobi (played by Ewan McGregor) in Star Wars: Episode I, The Phantom Menace as he steps off a spaceship and into the most anticipated cinematic event... well, ever. He might as well be speaking for the legions of fans of the original episodes in the Star Wars saga who can't help but secretly ask themselves: Sure, this is Star Wars, but is it my Star Wars? The original elevated moviegoers' expectations so high that it would have been impossible for any subsequent film to meet them. And as with all the Star Wars movies, The Phantom Menace features inexplicable plot twists, a fistful of loose threads, and some cheek-chewing dialogue. Han Solo's swagger is sorely missed, as is the pervading menace of heavy-breather Darth Vader. There is still way too much quasi-mystical mumbo jumbo, and some of what was fresh about Star Wars 22 years earlier feels formulaic. Yet there's much to admire. The special effects are stupendous; three worlds are populated with a mélange of creatures, flora, and horizons rendered in absolute detail. The action and battle scenes are breathtaking in their complexity. And one particular sequence of the film--the adrenaline-infused pod race through the Tatooine desert--makes the chariot race in Ben-Hur look like a Sunday stroll through the park. Among the host of new characters, there are a few familiar walk-ons. We witness the first meeting between R2-D2 and C-3PO, Jabba the Hutt looks younger and slimmer (but not young and slim), and Yoda is as crabby as ever. Natalie Portman's stately Queen Amidala sports hairdos that make Princess Leia look dowdy and wields a mean laser. We never bond with Jedi Knight Qui-Gon Jinn (Liam Neeson), and Obi-Wan's day is yet to come. Jar Jar Binks, a cross between a Muppet, a frog, and a hippie, provides many of the movie's lighter moments, while Sith Lord Darth Maul is a formidable force. Baby-faced Anakin Skywalker (Jake Lloyd) looks too young and innocent to command the powers of the Force or wield a lightsaber (much less transmute into the future Darth Vader), but his boyish exuberance wins over skeptics. Episode III, Revenge of the Sith Ending the most popular film epic in history, Star Wars: Episode III, Revenge of the Sith is an exciting, uneven, but ultimately satisfying journey. Picking up the action from Episode II, Attack of the Clones as well as the animated Clone Wars series, Jedi Master Obi-Wan Kenobi (Ewan McGregor) and his apprentice, Anakin Skywalker (Hayden Christensen), pursue General Grievous into space after the droid kidnapped Supreme Chancellor Palpatine (Ian McDiarmid). It's just the latest maneuver in the ongoing Clone Wars between the Republic and the Separatist forces led by former Jedi turned Sith Lord Count Dooku (Christopher Lee). On another front, Master Yoda (voiced by Frank Oz) leads the Republic's clone troops against a droid attack on the Wookiee homeworld of Kashyyyk. All this is in the first half of Episode III, which feels a lot like Episodes I and II. That means spectacular scenery, dazzling dogfights in space, a new fearsome villain (the CGI-created Grievous can't match up to either Darth Maul or the original Darth Vader, though), lightsaber duels, groan-worthy romantic dialogue, goofy humor (but at least it's left to the droids instead of Jar-Jar Binks), and hordes of faceless clone troopers fighting hordes of faceless battle droids. But then it all changes. After setting up characters and situations for the first two and a half movies, Episode III finally comes to life. The Sith Lord in hiding unleashes his long-simmering plot to take over the Republic, and an integral part of that plan is to turn Anakin away from the Jedi and toward the Dark Side of the Force. Unless you've been living under a rock the last 10 years, you know that Anakin will transform into the dreaded Darth Vader and face an ultimate showdown with his mentor, but that doesn't matter. In fact, a great part of the fun is knowing where things will wind up but finding out how they'll get there. The end of this prequel trilogy also should inspire fans to want to see the original movies again, but this time not out of frustration at the new ones. Rather, because Episode III is a beginning as well as an end, it will trigger fond memories as it ties up threads to the originals in tidy little ways. But best of all, it seems like for the first time we actually care about what happens and who it happens to. Star Wars: The Original Trilogy (Episodes IV - VI) The Star Wars trilogy had the rare distinction of becoming more than just a series of movies, but a cultural phenomenon, a life-defining event for its generation. On its surface, George Lucas's original 1977 film is a rollicking and humorous space fantasy that owes debts to more influences than one can count on two hands, but filmgoers became entranced by its basic struggle of good vs. evil "a long time ago, in a galaxy far, far away," its dazzling special effects, and a mythology of Jedi Knights, the Force, and droids. In the first film, Luke Skywalker (Mark Hamill) gets to live out every boy's dream: ditch the farm and rescue a princess (Carrie Fisher). Accompanied by the roguish Han Solo (Harrison Ford, the only principal who was able to cross over into stardom) and trained by Jedi master Obi-Wan Kenobi (Alec Guinness), Luke finds himself involved in a galactic war against the Empire and the menacing Darth Vader (David Prowse, voiced by James Earl Jones). The following film, The Empire Strikes Back (1980), takes a darker turn as the tiny rebellion faces an overwhelming onslaught. Directed by Irvin Kershner instead of Lucas, Empire is on the short list of Best Sequels Ever, marked by fantastic settings (the ice planet, the cloud city), the teachings of Yoda, a dash of grown-up romance, and a now-classic "revelation" ending. The final film of the trilogy, Return of the Jedi (1983, directed by Richard Marquand), is the most uneven. While the visual effects had taken quantum leaps over the years, resulting in thrilling speeder chases and space dogfights, the story is an uneasy mix of serious themes (Luke's maturation as a Jedi, the end of the Empire-rebellion showdown) and the cuddly teddy bears known as the Ewoks. "Empire of Dreams: The Story of the Star Wars Trilogy"